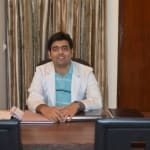 Dr. Rachit Mathur is a renowned Dentist in Laxmi Nagar, Delhi. He has helped numerous patients in his 11 years of experience as a Dentist. He has completed BDS, Fellow of Academy of General Education (FAGE) . You can visit him at The Dental Clinic in Laxmi Nagar, Delhi. Book an appointment online with Dr. Rachit Mathur and consult privately on Lybrate.com. Hi Sir, My teeth have become yellowish due to smoking and eating chicken I guess. Can you please recommend what I can do to whiten my teeth. Also is there any treatment and what is the cost. First of all, quit smoking. Than go for scaling and polishing by professional. This will cost you around 500-1000 bugs. For further whiteness of teeth, go for bleaching. The cost starts from 5000. What is the treatment if the tooth (right lower molar) is diagnosed as infected (by x ray). Is extraction only the option? If it is infected and you want to save it ask your dentist to check and tell you if rct is possible. I have yellow stains on my front teeth and doctors told me that this is fluorosis and has suggested me for composite veneering. Can you please suggest is it safe? It is safe. But at times success rate is not good. You can go for ceramic crowns instead. If you could please fwd me your pics. My teeth suddenly started decaying inspite of I am not having any sodas and sweets and also I have one milk tooth I am 17 still it has not gone and also I have cross bite what is the solution. First check whether the permanent is missing or still there inside your jaws where the milky tooth is present. Go for braces treatment for correction of crossbite. Also for cavities get it filled. Get your oral cavity checked by the proffesional once in a year. Since the patients feels constant pain in the intial stage of the orthodontic treatment, they should stick to food which requires no or very less amount of chewing. I am 23rd year old. I have oral submucous fibrosis. Mouth opening 33 mm. Chewing habit 5 year. Please suggest non surgical treatment. My tongue is getting harder which is causing difficulty in speaking due to eating of gutka .but know I have stopped that habit .so will be my tongue become normal again. You might be suffering from oral submucous fibrosis. Get treated with multivitamin supplements and lycopene extracts also. Visit a dentist or oral medicine and radiologist specialist who will give intraoral injections also following therapy may be administered under guidance- 0.5 ml intralesional injection of Hyaluronidase 1500 IU and 0.5 ml of injection Hydrocortisone acetate 25 mg/ml in each buccal mucosa once a week alternatively for 4 weeks or more as per condition. My mom has burning sensation inside mouth in tongue also she feel difficulty in eating hot and little spicy food. Doctor give some vitamin b complex medicine n she has no allergy or any diseases from past this is first time happen and also color of lips turned little black. Plez suggest what to eat to give relief or to make it fine. She is 42 year. Kindly apply dologel ct over affected area. For three to five minutes. And then rinse your mouth after that. This should be done two to three times a day daily for a week. Hopefully the burning sensation will come down. 20 minutes prior to eating food. Sir I want to have braces for teeth, what is the process for getting them and how much it cost. Waiting for your reply. Go to a orthodontist, tell your esthetic problems you face, he will make records of your teeth, then you can go for metal brackets or tooth coloured brackets, then banding and bonding of brackets will be done, it usually takes 1.5 weeks for all this, treatment duration will be around 8-15 months depending upon the problem, best of luck.